The side effects of any mould allergy can be very bad. You should never ignore symptoms that you have. Here are some of the most common symptoms of black mold for your home and your family’s health. Call us now for a mould inspection. Consistently red, itchy, and irritated skin is a symptom that black mould may be present in your home. The severity of this depends on your own skin’s sensitivity. Confusion, forgetting to do things, and other cognitive impairments can all result from exposure. Severe cases of exposure may result in permanent brain damage. Your doctor can help assess the severity of your problem. Major mood disorders have been attributed to toxic black mould. If you or a loved one has begun to have feelings and thoughts that are not like you, then the mycotoxins of black mould may be to blame. If you are doing your normal amount of activity and experiencing muscle aches and pains, then allergies may be the culprit. Severe muscle spasms and aches is a definite reason to go to the doctor. If you are getting plenty of rest and still feeling tired, then there might be an underlying cause for this that you might not immediately think of. If you are severely tired for more than a week at a time, then it may be time to talk to your physician. 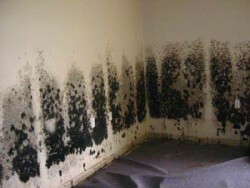 Black mould is known to cause people to lose weight. If you were otherwise healthy and are experiencing allergy-like symptoms and weight loss, then get your home tested for mold and other airborne allergens. While a lot of moulds is somewhat powdery and flaky, black mold that is thriving is shiny and gelatinous due to the high level of moisture. If the mould is old and the water source has dried up, then the mold may appear flaky. Never touch mould without knowing what you are dealing with. Black mould just doesn’t pop up anywhere. A constant state of very wet conditions for a week or more is required for mold to colonize successfully. Always pay attention to even small drips of water from pipes, appliances, and more. Make sure you routinely check for water leaks in your home to prevent all types of mold and damage to your home. If you are getting sick a lot for no explainable reason, then a mold is one option. Your immune systems response to fighting off any illness or infection can be severely impaired by black mould contamination. Black mould can make you think you are having a cardiac event regardless of your previous health record. This combined with any of the above symptoms further strengthen the evidence that black mould may be a part of your home.